Predict upcoming cash-in and cash-out, see projected trends and forecast your future pipeline. Track the status of each cash transaction and differentiate receivables/payables versus projected cash and paid money. Get the data you manage out of your head, out of your spreadsheet, and into dynamic, colorful and easy-to-understand visualizations. 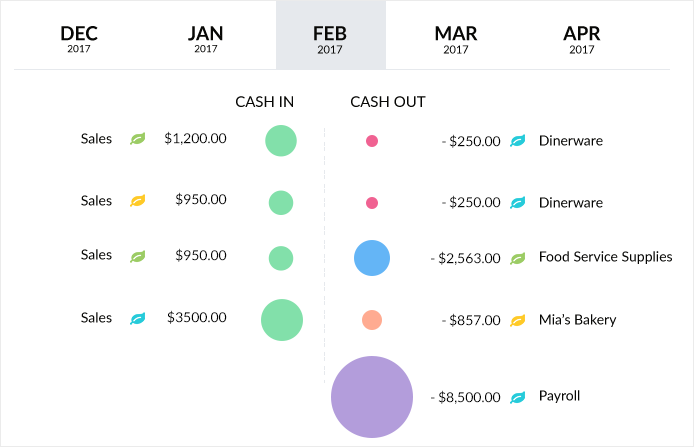 Cashvue's innovative bubble timeline uses color and sizing to indicate cash amount and category, letting you focus on key cash movers affecting your business. 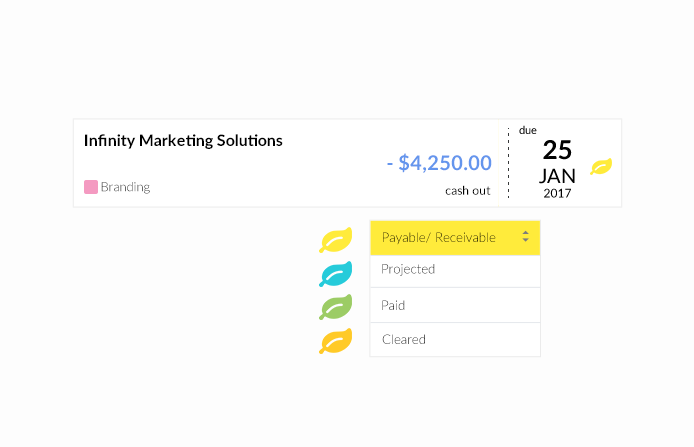 Cashvue lets you mark the status of every transaction, giving you an overview of cash statuses so you and your team can make smart decisions about pending payables, receivables, and projections. 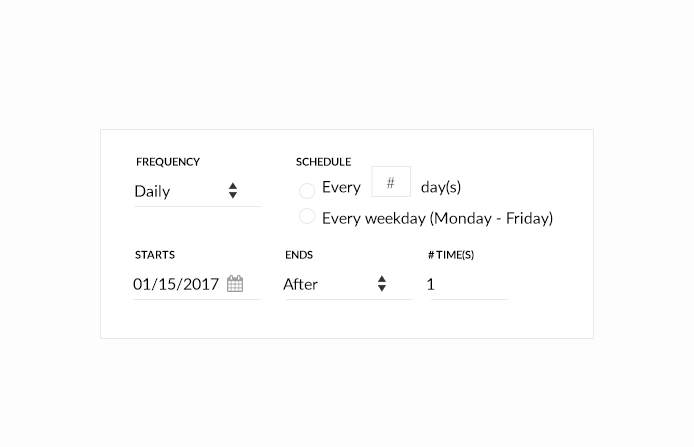 Evaluate your cash flow over different timelines in just one table. 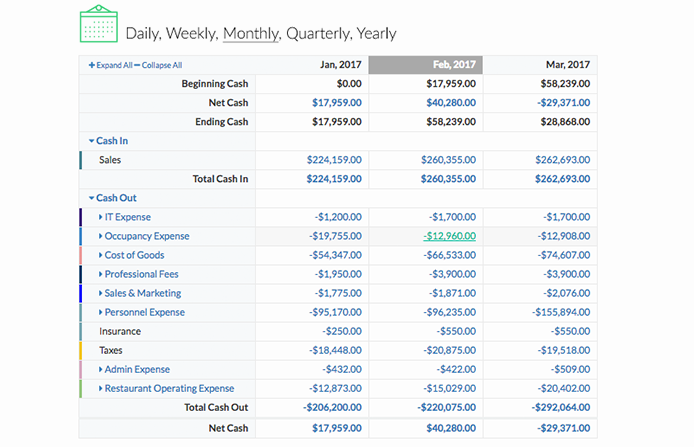 Unlike traditional spreadsheets, our interactive cash flow table lets you zoom in and out of different timelines with the click of a button. Cashvue is hosted over SSL, which secures and encrypts all data between your computer and our servers, so you can work with confidence. Invite new users and edit their permission levels, easily controlling how you collaborate as a team. Review, update and manage cash flow online, anytime and anywhere. 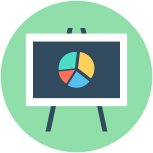 Our filterable graphs, charts, and visuals make it easy to see data in a way that makes sense to you. Create repeat entries and forecast future cash activities using different ascending/descending formulas. 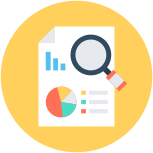 Analyze cash history and trends by filtering data based on various criteria. Manage upcoming AR/AP and both confirmed and unconfirmed cash transactions using statuses. 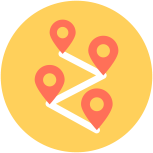 Label transactions to add additional dimensions to data and generate reports based on those tags. Cashvue is in public beta mode right now, which means it's free to use. We appreciate any and all feedback, so please take Cashvue for a test drive, see what you think, and send your feedback to hi@cashvue.com. Who is Cashvue built for? What happens to our cash position if vendors can't pay on time? What are the foreseeable expenses for a specific project? How will our cash flow be impacted if we make this expensive purchase? Who are the users of your system? Our core customers are bookkeepers, accounting staff, managers, and sales teams, or basically anyone in your company who makes frequent cash decisions. Sign up by clicking the TRY IT FOR FREE link. Once you sign up, you’ll get a unique URL for your account. Then, you can invite collaborators who need access and easily set up their permission levels. Is data secure in beta? Yes, all of your data is HTTPS SECURED during beta, and beyond. Please email us at hi@cashvue.com and we'll respond as soon as possible. Start managing Cash flow with Cashvue Sales Professional. If you prefer to play with a demo account on cashvue. click here and login.